MANILA, Philippines – The 'September 2017 LET results' or the Licensure Exam for Teachers (Elementary and Secondary levels) list of passers, top 10 examinees, top performing schools, performance of schools and related announcements are available at this website as PRC officially released the results online 43 working days after the board examinations. As announced, 21,198 elementary teachers out of 80,509 examinees (26.33%) and 49,626 secondary teachers out of 107,020 examinees (46.37%) successfully passed the exams. PRC said that of the 21,198 passers in elementary level, 19,581 are first timers and 1,617 are repeaters while 41,180 secondary teachers passers are first timers and 8,446 are repeaters. 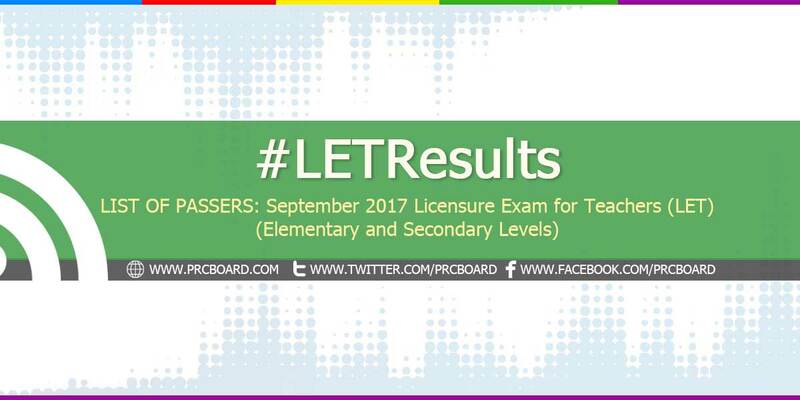 The September 2017 Board Licensure Exam for Professional Teachers (BLEPT) are administered by PRC Board of Professional Teachers headed by its Chairman, Dr. Rosita L. Navarro, Vice Chairman Dr. Paz I. Lucido and its members, Dr. Paraluman R. Giron and Dr. Nora M. Uy on September 24, 2017 at PRC testing centers located in Manila, Baguio, Bacolod, Cagayan de Oro, Catarman, Northern Samar, Cebu, Davao, General Santos, Iloilo, Laoag, Legazpi, Lucena, Rosales, Pangasinan, Tacloban, Tuguegarao, Pagadian, Zamboanga and additional testing locations at Boac, Marinduque; Calapan City, Oriental Mindoro; Kidapawan, Cotabato; Mamburao, Occidental Mindoro; Masbate City; Odiongan, Romblon; Puerto Princesa City, Palawan; and Virac, Catanduanes. According to the Commission’s Resolution No. 2016-1019 series of 2016 entitled “Schedule of Licensure Examination for Year 2017”, the target release date of September 2017 LET result will be on November 27, 2017 (Monday) or forty four (44) working days after the board exams. The number of working days is computed with respect to declared holidays in October and November 2017 particularly the additional special non-working day on October 31, 2017 (Tuesday) and "All Saints' Day" on November 1, 2017 (Wednesday). On the same exams conducted by PRC on March 2017, results were out after forty (40) working days. During September 2016 and September 2015 LET, results were out after forty eight (48) working days while forty one (41) working days on March 2016. The schedule of registration for issuance of Professional ID and Certificate of Registration will be from December 4 to December 8, 2017 for Elementary Level and December 11 to December 22, 2017 for Secondary Level. Meanwhile, all registered and licensed passers can now append their names the title "LPT", or Licensed Professional Teacher (e.g. Juan A. Dela Cruz, LPT), pursuant to Board Resolution No. 01-2017 of the Board of Professional Teachers. The September 2017 LET for elementary and secondary levels covered the following GenEd and ProfEd topics. To receive up-to-date news about September 2017 LET Teachers board exam results, we advise our visitors to bookmark this page, visit PRC official website or follow us at our social media pages via Facebook and Twitter. With God, nothing is impossible. Keep the faith! God bless us oh Lord! Lord God, I am positive to pass the exam because you are at my side. I love you lord god. Big letter palagi ang umpisa pag isulat Ang pangalan ng ating Panginoon. If you have done your part, God will do His too! Its not a luck, but its a blessing of your industry and hard work! Ora et Labora - Pray while you work, then God bless you with all the abundance of His graces. "LET"us all pray to our Almighty God..
we will pass the exam..
Godbless sa lahat ng future teachers..esp me.. PLEASE LORD, INCLUDE MY NAME.. I CLAIM IT LORD.. PARA SA PARENTS KO TO.. PAPASA AKO!!! IN GOD'S GRACE.. THANK YOU LORD.. If ever po, san po nyan meron oath form? Sa prc po ba mismo? Sa DOH po. Or pwede din po sa Jollibee. Please God let me pass the board exam.. This is all for my parents..
dai naa na ang result. wala ka nainform? Good luck to us..We claimed it already in Jesus Name...Godbless us all..
Alam qng mkapasa aq ..nothing is impossible if GOd with us..ito na best gift na maialay q sa pamilya q.
I put my trust in you Lord. Lord ikaw na po bahala sa kanila. Lord, i trust in You. Kau n po bahala sakin/samin na nag take. Bless mo rin po ang PRC at ang machine na nag check ng exam namin. Thak You Jesus. Amen. May these names be on the list of passers dear Lord. God u know my heart's desire.Let me be a blessing to everyone. I pray for all BEED-SPED of NSU. keep your hopes up, we will PASS! Lord pls.help me to pass the LET. Please hear us oh Lord! May this upcoming result an everlasting gift for us. Pasar nakam NOVAH PAHIMNAYAN tapos MICHELLE TOMENIO. Pasado kana: Precious Villena ng Mindanao Region. Commit to the Lord whatever you do and all your plans will succeed. Lord kayo na po bahala, Nothing is impossible without you Lord Father God. PAPASA AKO! In Jesus Name. Amen. God tni mka pasar asawa ko. tagal naman ng result. excited n akong makita name ko sa mga topnotchers list. whoo. i should know. Lord God whatever it is I will accept it. ..
Lord, i highly hope that your grace be with me. For i want to pass the exam. Sana po Mabasa ko name ko.....Thank you po! Kailan po ilalabas yung list po? I dedicate to you O lord and Lift to you the result of my board exam in your will Lord God I believe I made it and in JESUS name I pray, Amen!!! Good luck to the graduate of bachelor of arts in literature and language teaching batch 2017. Go! Elites. God Bless him po.. Sana makapasa siya..
Nanunuod pa sila ng Miss Universe HAHAHA. Nanonood pa sila ng Miss UNIVERSE Guys. What time ba lalabas ang result?nakakakaba. haha nanonood pa daw sila ng ms universe pageant. ang kuleet! Just Pray and Declare! Nothing is Impossible Through Him! LORD! We declare sa lahat ng naghihintay ngayon ng kanilang mga LET Result exam, We claim it LORD victory upon victory sa mga buhay namin. Sayo po namin ipinagkakatiwala ang lahat ng ito, sapagkat ang Pangako mo ay Buhay at Totoo. Just Believe, By MEGAFaith! In Jesus Name Amen and Amen! Lord sana po makapasa na ang asawa ko..sana po goodnews ang mangtari nagaun..thank you lord..
What time daw ang result mga palanga? Ang daming umaasa kay lord dito. Lahat yan malamang nagbulakbol. Derpor, bagsak lahat. Ilabas na ang results! Tapos na ang Miss Universe mga manshie! Ilabas nyo na yan! LORD GOD PLEASE ANSWER MY PRAYER TO PASS THE LET EXAM.I LOVE YOU LORD GOD. Lord sana po kung anu man maging resulta ngayung araw palagi mo parin po sana kaming patnubayan..I'm praying nd hoping na sana makapasa na ang asawa ko..subra na kana ko sana po lumabas na result..thank you lord and gudluck po sa lahat nang nag aantayng result.. Your will be done Lord..
nov.27 na...san na po yung result? ito na ang huling take ko ng exam gamit ang aPilyido ng tatay ko dahil ikakasal na ko next year at PaPasa na ko ngayon! huwag nyo po damay si god kasi di naman sya ang ncheck ng papel nyo kung tlagang ngreview kayo papasa kayo at kung tlgang nagaral kayo. Pinapaasa nyo naman po kami 😭 natatakot at kinakabahan na nga po kami sa result tapos di nyo pa ilalabas. Sana wag nalang magpost2x na today kung di naman ilalabas ngayon . anong oras po opost yung result? Thank you so much for the Updates! To God be the Glory Forever and Ever! ngayun po ba talaga ilalabas ang result? Congratulations to everyone! Ung mga hindi nakapasa, wag pi kaung susuko. Prepare for the March 2018 exam. Godbless! Wala po ba yung School Performance for Secondary Level? Bkt may dalawa pa bang pumasa? For taking LET exam for Teacher..
Ano po ibig sabihin nung may dalawang pending pa ang result ng exam nila?kailan po malalaman kung pasado sila o hindi?para po sana makapagready na for the upcoming review period and next examination.thank you to hear from you PRC. GOD BLESS! Kailan po malalaman yung names nung dalawang pending ang result ng exam nila? Para atleast po malaman yung next nilang gagawin, kung magrereview po ba sila for the upcoming review period and prepare for the next examination. Thank you to hear from you PRC. God Blessed You All. Hello po pwd po bang sa ibang prc region mag file for registration for oath taking?